From Presidents Trophy to the Brink of Elimination, What is Going On in Tampa Bay? - The Point Data-driven hockey storytelling that gets right to the point. The series started off so well for the Lightning. They scored three goals in the first period of Game 1 and looked set to steamroll the Blue Jackets like most, us included, predicted. As it turns out, they haven’t outscored the Blue Jackets in a period since. They are looking completely flustered by Columbus and to say their game has suffered as a result would be a massive understatement. 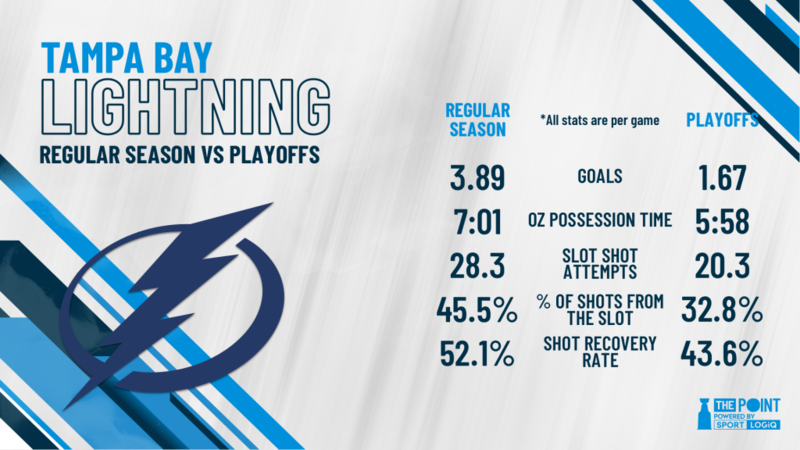 The Bolts are able to skate the puck into the zone about as regularly as they did in the regular season, with 44.7 controlled entries per game compared to 44.5 in the regular season, but they’re not the same team once they get into the zone. John Tortorella’s team is forcing them to the perimeter and they haven’t found a way to the slot nearly enough for such a high-powered offense. As a result, less than a third of their shot attempts come from the middle of the ice, which would be worse than the Kings season-worst mark of 35.5%. That problem is compounded by their inability to get pucks back after those low-quality shots, recovering a horrendous 43.6% of loose pucks, via either rebounds or recoveries after missed or blocked shots. Only one team (hi again, L.A.) failed to recover the puck at least 50% of the time all season. The sequence that led to the empty-net goal is a perfect example. A shot from the outside, no one home to recover the puck and Columbus brings it back for the final nail in the coffin. Body language shows this team is getting frustrated, just look and Ryan McDonagh’s reaction after that empty-netter. It’s a vicious cycle that can easily spiral out of control. More frustration leads to poor play which just leads to more frustration, so on and so forth. It doesn’t help that the Blue Jackets seem to have a lot of bounces going their way. Despite the 3-0 series, both teams’ expected goals tally has been nearly identical. 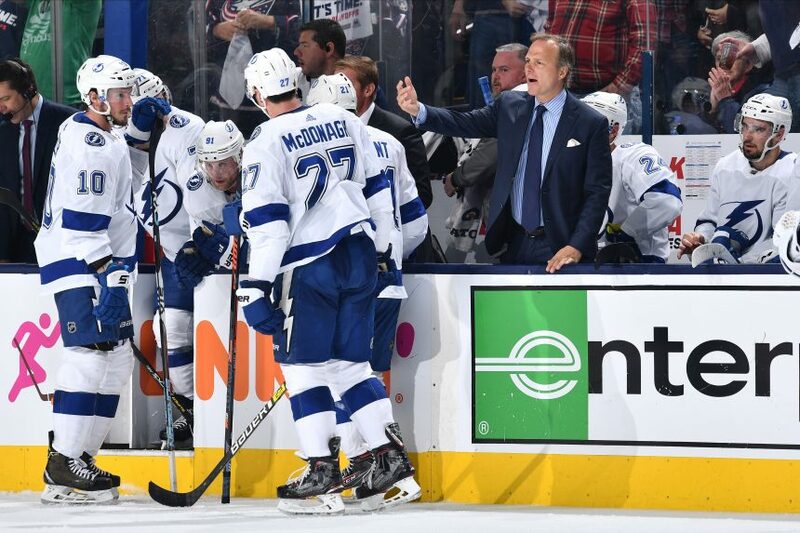 7.68 for the Lightning, 7.60 for the Blue Jackets, yet goals are 12-5 in the underdogs’ favor. 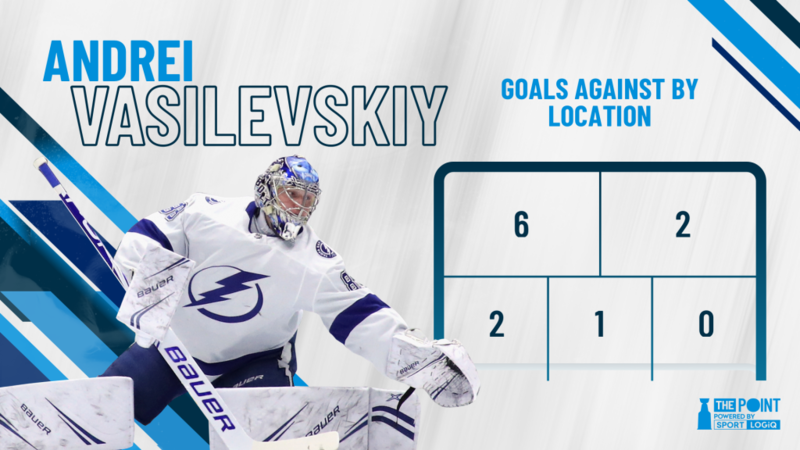 Andrei Vasilevkiy went from a Vezina-caliber season where he saved more goals relative to league average than anyone in the NHL to costing his team over a goal per game. Now, don’t get me wrong, I’m not saying Vasilevskiy is overrated or that he’s a terrible goalie, but he’s definitely not been his regular season self over the last three games. He’s been especially struggling on high-blocker shots, giving up more goals in that area than the rest of the net combined. Combine a frustrated and struggling offense with shaky goaltending and you get the recipe for an upset. Now, if there’s one team that has the tools to come back from an 0-3 deficit for only the 5th time in NHL history, it’s these Bolts. They’ll have to overcome a white-hot Blue Jackets squad who are riding high on momentum and will have a roaring home crowd behind them in Game 4. It’s not over ‘till it’s over, but Columbus is now where no one expected them: in the driver’s seat against the President Trophy winners.